A few years ago, a magazine editor from New York contacted me and asked me to draw something up for their cover. The theme she was suggesting was as ambiguous as it gets: "Something about creativity?" From behind the safety of my glowing computer screen, I hemmed and hawed and picked through my brain like it was an overflowing junk drawer. Maybe there was something I'd shoved in there at some point, tucked towards the very back, that I could pull out and make into something? I said I'd give it a try, along with a fervid disclaimer about not being a professional and being really unsure that I could even come up with anything (like a clause in my agreement could protect me from her criticism after the fact if my work was anything less than par). The editor wrote back, "It'll be great. You'll do great. Just do anything, and it'll be what I want." I wasn't optimistic, and the parameters were much too wide for my liking, but I was also excited to try. Flattered to have been asked. I have a suitcase with everything in it. All of my paints and hand-me-down art supplies - glue and tape and string and paper and pencils and oils and charcoals. It's all stuff I've collected from other people who were 'making space' in their own junk drawers. A lot of it I don't even know what to do with. Slightly used but in fairly good condition. That day, after the email exchange, I sat down on the floor of my dining room and emptied that suitcase onto the floor around me so I could see it all. I sat in the middle of the mess and picked up a sketchbook that had been flung to the floor by my right knee. The page stayed completely blank for an hour. Two hours. Three. I became insanely frustrated with the whole thing. Something to do with creativity. I was surrounded by all of the tools, but I didn't know what to do with them. I felt like Creativity was a person, and we were in a fight. I snapped a crayon in half and examined the inside. I got up and left the room. I came back in and surveyed the scene from above. And that was what did it, I guess, because then I sat back down and got to work. I drew the crayons, and pencils, and the brushes and oil pastels and the watercolours and the string and the books and the tape and even my coffee, which was now quite cold. 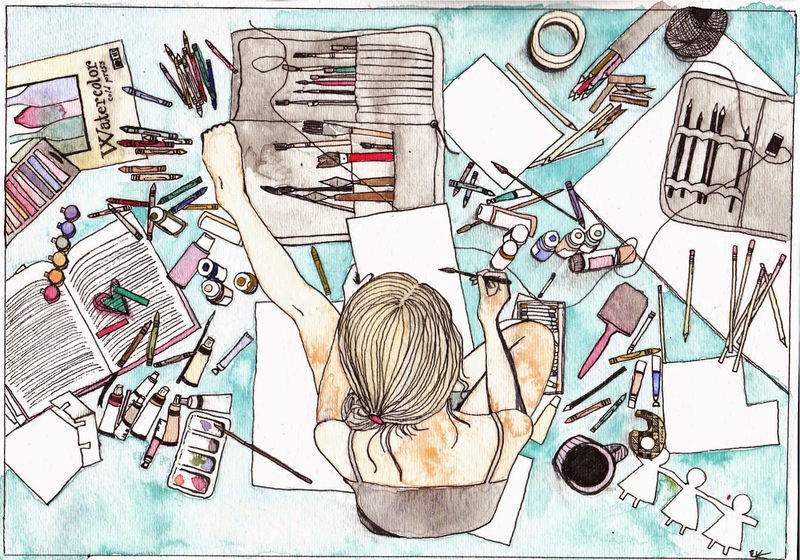 And in the middle of it all, I drew me and my blank page. It was a picture of not knowing what to draw a picture of. And I liked it. The magazine folded. Like, not as in 'in half', but as in 'doesn't exist anymore'. So this picture has been just sitting in a folder on my desktop. This morning, I wanted to write about something, but didn't know what to write about, and then I came across this picture and thought I'd write about it. It seemed fitting. I like that about creative things - that the point is not always (or usually, for me) the subject. The point is just to get something down on the paper (or the screen, or whatever) and to be happy with the final result.